A convoy of at least 70 trucks protesting Ottawa's oil and gas policies passed through Manitoba on Friday on its way to Parliament Hill, hoping to pick up steam among local drivers. "We want the current government to realize that they have a huge disconnect with a lot of issues, and the biggest is our oil and gas industry needs to get back in order — and our farmers," said organizer Glen Carritt Friday morning. "Everybody's hurting because the carbon tax is way too much." 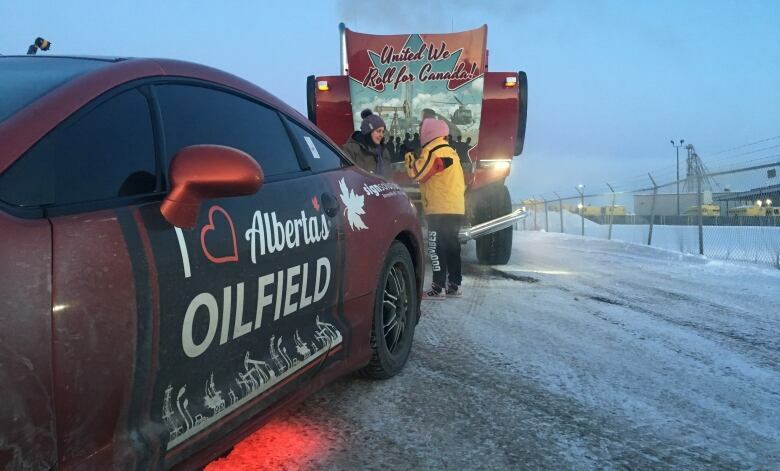 Carritt was driving one of roughly 170 trucks that left Red Deer, Alta., early Thursday morning with a destination of Ottawa as part of the United We Roll protest. He said drivers want to show their opposition to the federal carbon tax and Bill C-69, federal legislation that would change the way energy projects are reviewed, as well as other policies they say are hurting the economy. On Friday morning, Carritt said the convoy had slimmed down to a core group of about 70 trucks. He was hoping to pick up at least 30 more in Manitoba and Ontario on the way to Parliament Hill for a final rally. Some of the participants are supporters of the yellow vest protest movement, Carritt said. But he has said the racist and radical views espoused by some yellow vest supporters aren't part of his protest. Cleared Deacon's Corner after 6 p.m.
"We just want our voices heard," he said. "There's an election coming up and we want people to realize how important the oil and gas industry is for the rest of Canada." 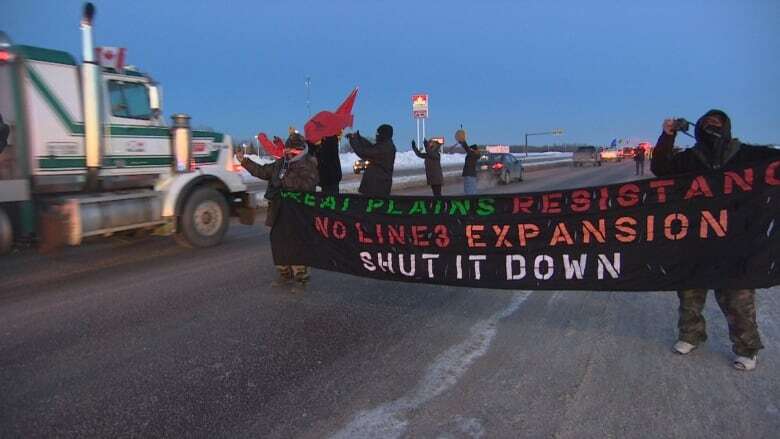 The convoy was slowed down briefly early Friday evening as it left Winnipeg, when protesters gathered at Deacon's Corner to express their opposition to the movement. "We're against the message they're bringing," said Harrison Friesen, one of about 10 people who stood at the side of the highway, waving flags and shouting at the trucks as they passed. "For us, we're against pipelines, we're Indigenous land defenders. I'm from northern Alberta — I have concerns about what happens with the tar sands, what happens with the community." The RCMP closed down one lane of Highway 1 eastbound just after 5:30 p.m. to give protesters a place to safely stand, warning them not to interfere with traffic in the other lane. Although this slowed the convoy's progress, the line of vehicles had all cleared the intersection shortly after 6 p.m.
"These people that are out on the road here ... they' don't like the fact that we've got a convoy that wants to promote the pipeline and promote oil," said United We Roll supporter Les Michaelson, who drove ahead to scout any potential problems the vehicles might encounter. "We want to put people back to work and doing otherwise is actually going backwards." Carritt described the convoy as a grassroots movement of drivers who want to stand up for Canada. The protest has received support from an online GoFundMe fundraiser, he said, which he's hoping will continue to take a bite out of the fuel cost of the journey. For the big-rig trucks, that could be as high as $6,000, Carritt said. Whether it's drivers on the road or protesters at Parliament, Carritt said he hopes to see more people out supporting his cause. "Everybody is welcome as long as they're peaceful."